From wedding toasts to festive birthday cards, the New Oxford Rhyming Dictionary has what every writer (or budding writer) needs--rhymes for over 45,000 words, including proper names, place names, and foreign terms used in English. A marvel of clarity, the Dictionary is incredibly easy to use, its clear organization and layout making it a snap to find the rhymes you're looking for. Words are grouped by sound and there is also a complete alphabetical index to help you quickly navigate to the relevant section. In-text notes offer tips on using rhymes effectively, make suggestions for expanding the rhyming lists included in the book, and give examples of how poets past and present have used rhyme. In addition, the fascinating introduction by John Lennard offers a brief outline of rhyming in its literary and historical contexts, and gives further advice on creative writing. This new edition includes over 200 words added to the Oxford Dictionary of English since the publication of the original volume, including iPod, Americano, and vuvuzela. 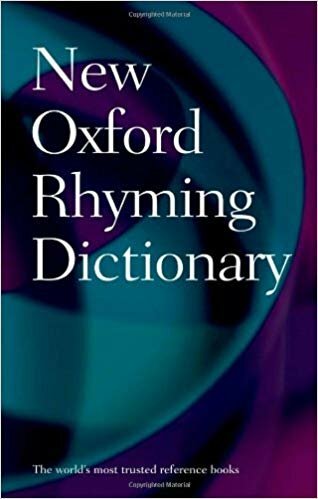 In short, The New Oxford Rhyming Dictionary is a must-have tool for poets, lyricists, and writers of all kinds, as well as a delight for everyone who likes to play with words.